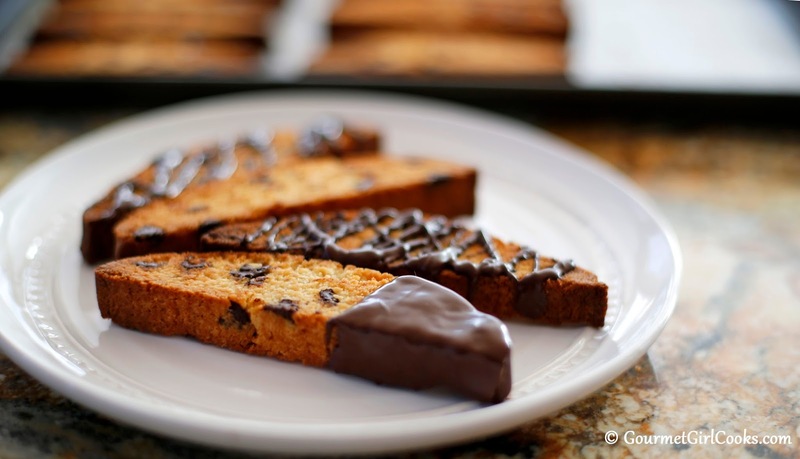 Today I'm re-sharing my recipe for Chocolate Chip Biscotti. I absolutely LOVE these biscotti. A couple of years ago, I tried my hand out at making biscotti after one of my sons gave me a biscotti pan (by USA Pan) for Christmas. One of my favorite flavors of biscotti is cranberry pistachio, but since it was my first run at making biscotti, I decided to go with chocolate chip, not to mention it's a more popular flavor. A few weeks after making these biscotti, I actually made my favorite Cranberry Pistachio Biscotti. They turned out amazing as well. 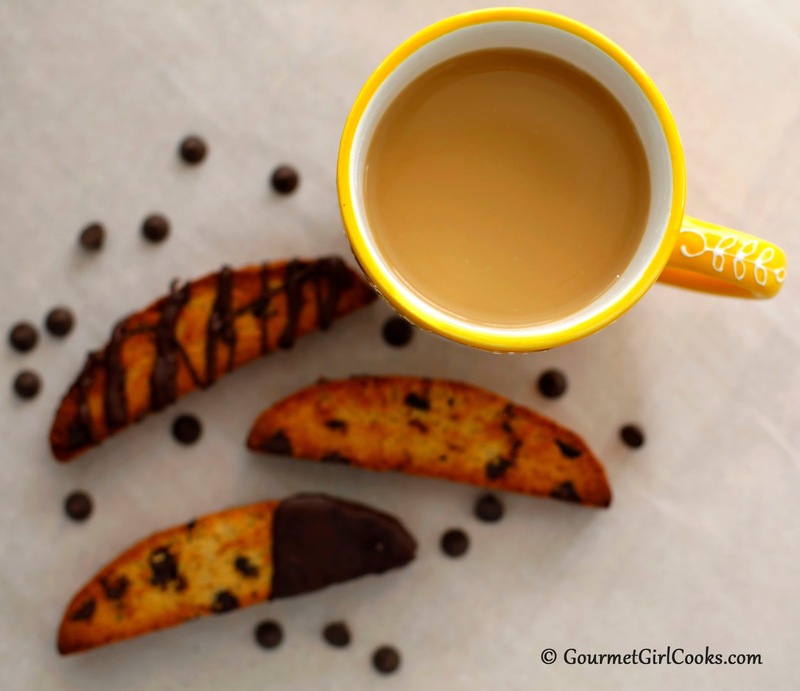 I was so excited at how these biscotti turned out and surprised at how easy they were to make. Even if you don't own a biscotti pan, you don't need to have a special pan to make yours; a simple cookie sheet will work just fine (although I really do love my pan)! 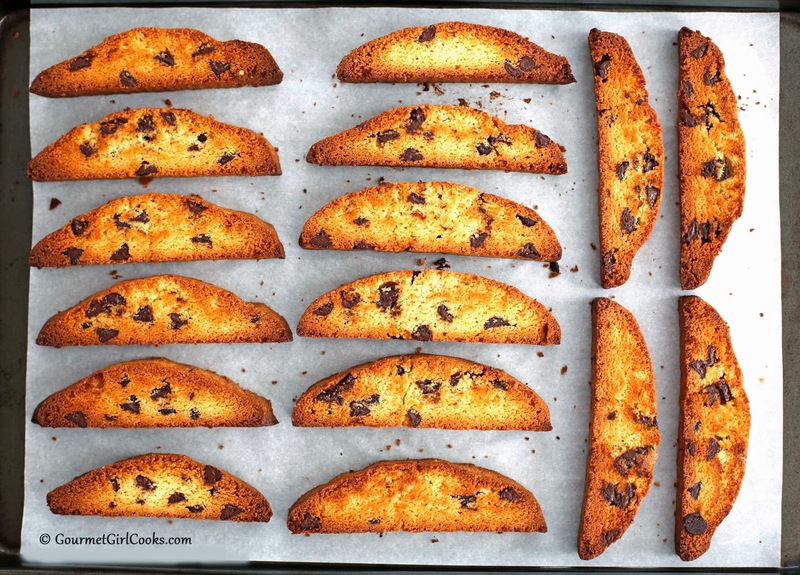 If you've never had biscotti before, they are a dry, crisp, twice baked cookie that originated in Italy and they're not too sweet. They are baked the first time as a loaf, then sliced and baked on a cookie sheet the second time until they are dry and toasty. I think they're best dunked in coffee. The commercially made biscotti that I used to eat contained 18 grams of carbs and 10 grams of sugar each. My grain free version made with almond flour and sweetened with Swerve only contain 3.7 net carbs and 1.8 grams of sugar each which is a huge difference. Check out my recipe and photos below. Enjoy! Preheat oven to 350 degrees F. Lightly grease a 12” x 5-1/2” biscotti pan or 18” x 13” baking sheet (or line with parchment). In a medium bowl, cream butter and granular sweetener together. Add vanilla and beat in the eggs. Add almond flour, coconut flour, baking powder and salt, stirring until smooth. Mix in chocolate chips. 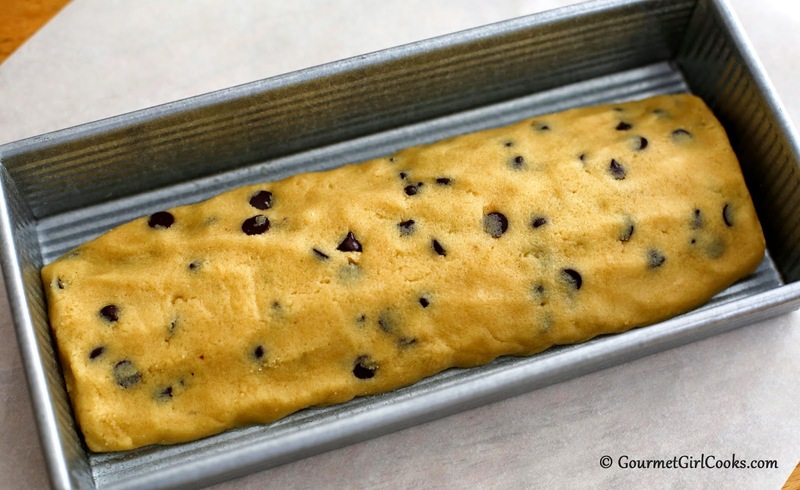 Scoop dough into the center of prepared biscotti pan. Using wet hands, shape dough into a log shape mounded slightly higher in the center. Leave approximately a 3/4” space around the edges of the pan to allow room to spread during baking. 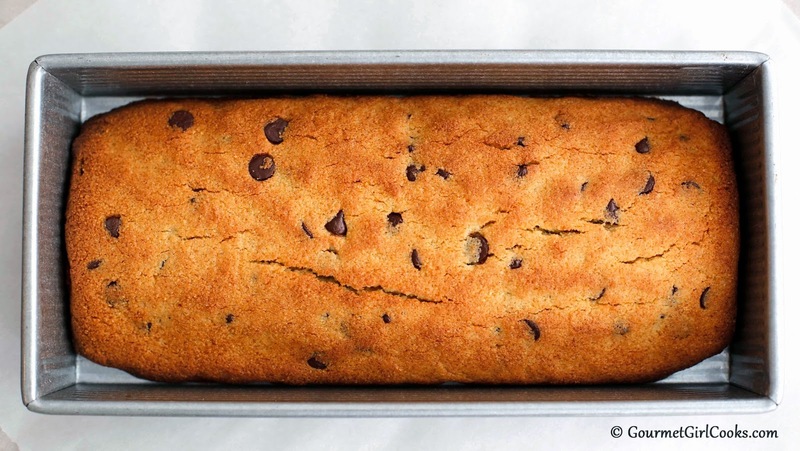 If using a baking sheet, place dough in center of prepared baking sheet and shape into a log approximately 10-1/2” x 3”, mounding slightly higher in the center. Bake for 30 to 35 minutes until golden brown. Allow to cool in pan for 20 minutes, then carefully remove from pan and transfer to wire rack to cool for about one hour. Reduce oven temperature to 300 degrees F. Using a sharp chef’s knife, slice biscotti crosswise into 3/4" slices (they can also be cut diagonally, if preferred). Lay slices on sides on parchment lined baking sheet. Bake 20 to 25 minutes, or until dry and golden; cool completely. Biscotti continue to dry and crisp as they cool. Store in airtight container. 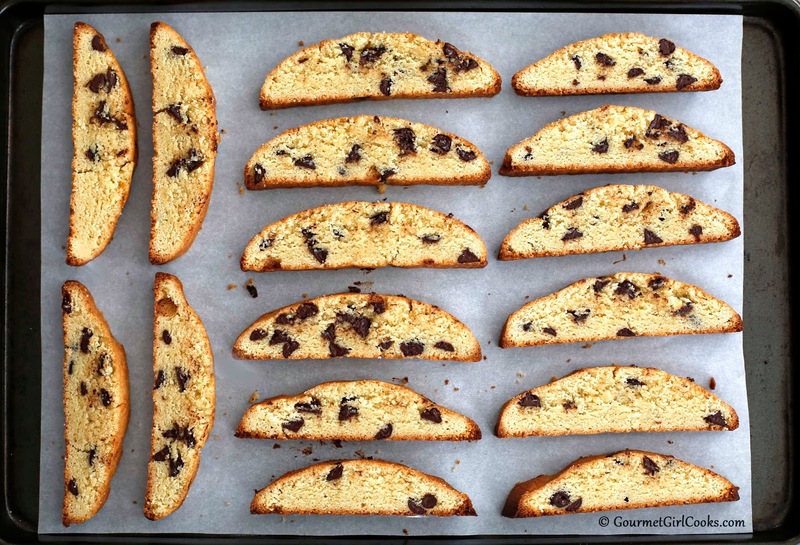 *Notes: If biscotti slices begin to brown too quickly, reduce oven temperature to 275 degrees F. If desired, biscotti can be dipped into or drizzled with melted dark chocolate. *Nutrition Information: Each serving contains approximately 3.7 grams net carbohydrates (total carbohydrates minus fiber) and 1.8 grams sugar. Hi Ayla, I have to share my personal observation here. When I get a grain free recipe for baked goods called Biscotti or chocolate chip cookies or brownies , I am always disappointed, not that these concoctions are not good, but there is a let -down because it just is not a biscotti as we know it, or a chocolate cookie or brownie ., If these very good creations had their own unique names, one would not expect a biscotti, brownie, etc. and there fore not be disappointed. Just a thought. I admire your talents and enjoy many of your recipes, so please let this post not upset you-because you are fabulous and such a talent ! I hear you! 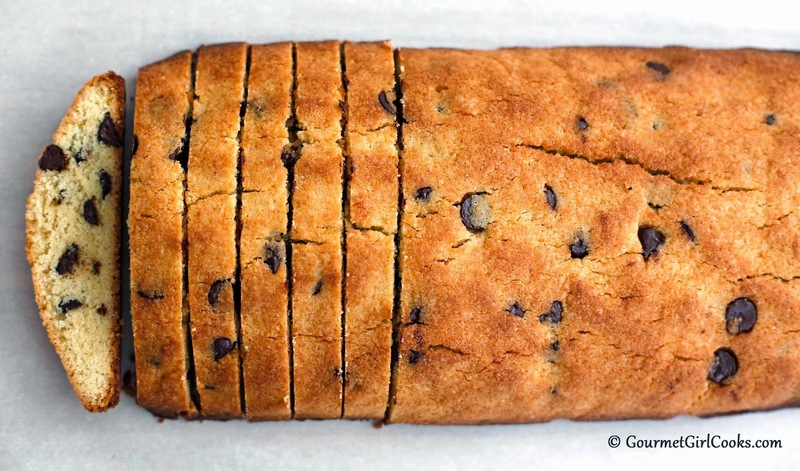 If you have a suggestion for what to call a grain free chocolate chip cookie, biscotti or brownie...I'm all ears! Unfortunately I have not eaten a regular version of these items in over 5 years so I no longer compare them to their wheat cousins. It's an intriguing thought but one I would have no clue how to go about. 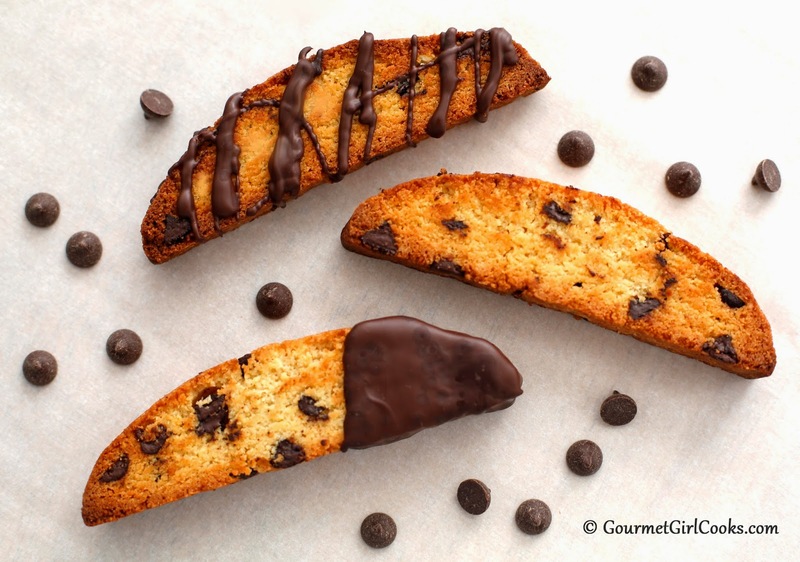 Have you tried these biscotti yet? If so, what would you suggest I call them where someone would want to try making them? For me the only difference with these is they are crisp instead of rock hard like the regular version. On a different note, how have you been? I know you said you moved from SF. Are you still in California? My life has been fairly crazy this past year. I hope your arthritis is manageable as much as it can be. I haven't heard from you and have wondered how you were doing. Our upstairs a/c has been out and being replaced tomorrow. Oh the joys of home ownership! Let me know how you are doing and seriously, if you have any name suggestions for recipes I'd love your input. Hope you are doing well! Dear Ayla, Hope that you will be safe in Atlanta (Hurricane). I had great success with both of your wonderful biscotti recipes, so much so that the whole family loved them (ie: the wheat-eaters in the house 😬). They are definitely not as hard as an old-style rock hard biscotti, but even when I baked my own wheat versions years ago they were never as hard as the bakery-bought variety. Love these ones and with the cooling weather I am thinking it's time to bake some more! Stay safe and dry over there Ayla!